The Publishing Cafe: The New Kindle Fire HD 8.9"
The New Kindle Fire HD 8.9"
Jeff Bezos holds up the new Kindle Fire HD 7" and Kindle Fire HD 8.9"
Amazon today announced that Kindle Fire HD 8.9" - the large-screen version of its best-selling tablet - is now available in the UK, Germany, France, Italy, Spain and Japan. 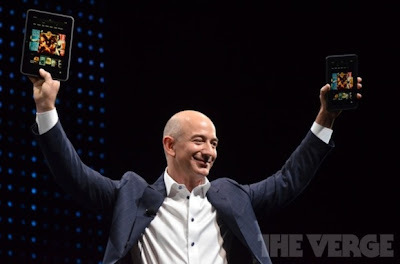 Large 8.9" display has the highest resolution of any Kindle Fire (1920x1200, 254 ppi). Custom Dolby audio and dual stereo speakers for crisper sound. Over 23 million movies, TV shows, songs, magazines, books, and audiobooks. Ultra-fast web browsing and streaming with built-in dual-band, dual-antenna Wi-Fi. Front-facing HD camera for taking photos or making video calls. Exceptional battery life - Kindle Fire HD 8.9" gets 10 hours of battery life. Easy-to-use e-mail, calendar, and contacts for work or home, including Gmail, Hotmail, Exchange, and more. New Amazon-exclusive features like X-Ray for Movies, X-Ray for Textbooks, Immersion Reading, Whispersync for Voice and Whispersync for Games. Kindle FreeTime, a free, personalized tablet experience just for kids and exclusively available on Kindle Fire. Parents can set daily screen limits and give access to appropriate content for each child. "Buy Once, Enjoy Everywhere" so customers can use their Amazon content on any of their devices. Jim Carrey says self-publishing is cool!